I’m so excited to share with you my Grandma’s Homemade Kolaches recipe! You may recall, I recently posted a recipe for my Grandma Longwell’s amazing homemade cinnamon rolls. Those are a childhood memory I still cherish to this day. Another one of her classic baked goods was her Homemade Kolaches recipe. Oh my, what wonderful, delicious memories. Whenever we’d travel up to Belleville, Kansas for Christmas…as soon as we walked in the door, the incredible inviting smell of fresh baked pies, pastries, Swiss steak, and vegetables from Grandpa’s garden (that had been canned from the previous Summer) immediately said “hello and come in” to your senses. 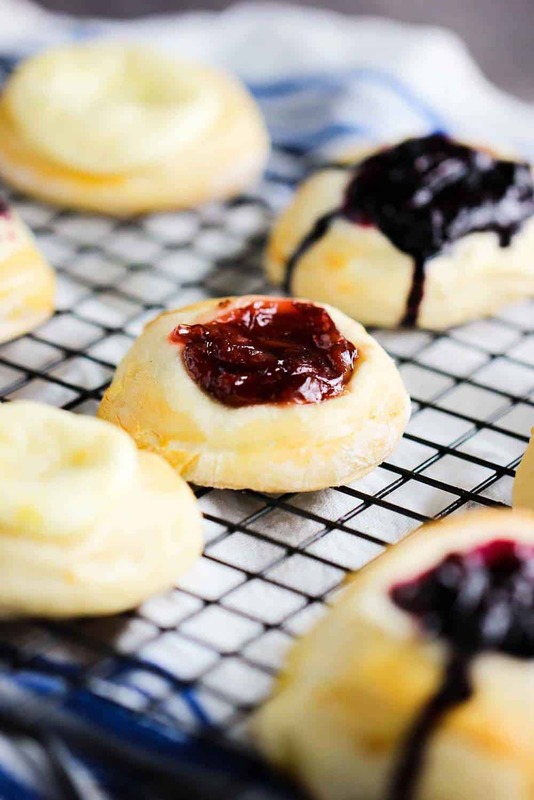 Homemade kolaches are a delicious, sweet Czech pastry. These take a little time and a bit of tender loving care..but my goodness, are they good. As with any pastry, you’ve got to start with a good dough. Grandma made lots of baked goods, and she used the same dough for most of her pastries and breads. Don’t rush the dough. It may take an hour for it to double in size, or it may take 2 hours. 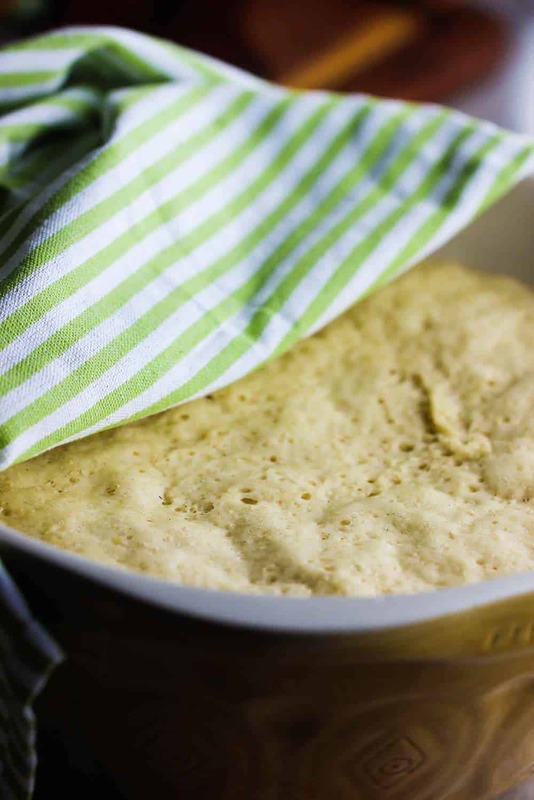 You can even place the dough in an oiled bowl, cover with a kitchen towel, and let rise in the refrigerator for overnight. Then, once you form the round pastries, you’ll want them to rise until almost doubled in size again. As my Grandma would say: Patience is a virtue. Is there anything better than a warm, loving grandma and grandpa? I loved my grandparents (both mom’s and dad’s) so very much. 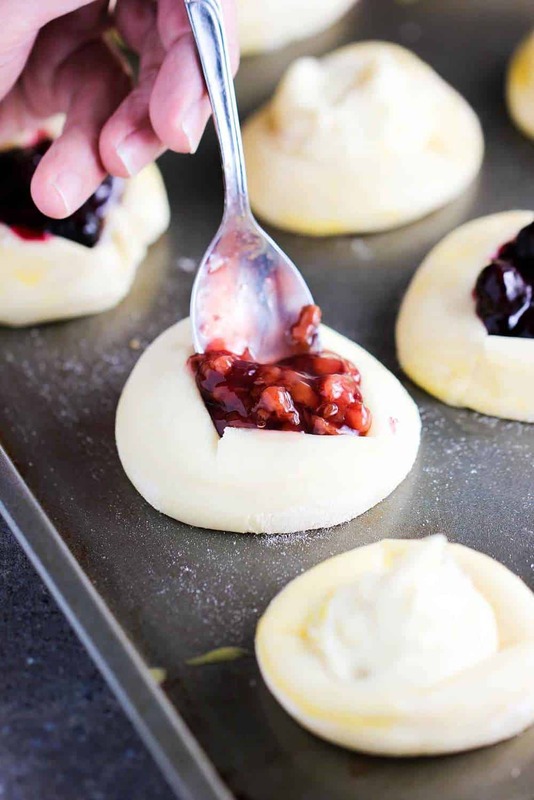 Traditional toppings for Homemade Kolaches are fruit (we love cherry and blueberry), as well as cream cheese and poppyseed. These are easy to make and can be prepared a day or two in advance and stored in a container in the fridge. I like to use a 3-inch cookie cutter to form the circular dough rings, but you could easily shape them with your hands, or even an inverted clean can or glass. Create a small well in the center of each dough ring and then fill with the prepared fillings. The Homemade Kolaches are about to go into the oven!! Wait for that incredible smell! 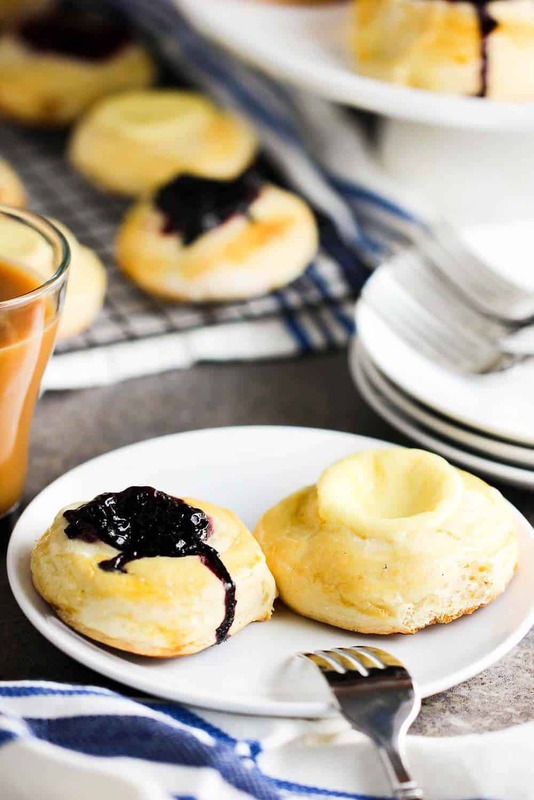 As mentioned, Kolaches originated in Czechoslovakia, but became popular in the United States in the mid-1800s, and especially popular across the great state of Texas years later. Being a native Texan, I was fortunate to have Homemade Kolaches all around me. But I must confess, none were better than my Grandma’s Homemade Kolaches. Read about the history of Kolaches and how they became so popular in the Lone Star State. I tell you what, life is good when Homemade Kolaches are involved. When these are baking in the oven, I am transported back to that wonderful time with my family at Christmastime. I hope both sets of my Grandparents in heaven can smell these as they are baking and know how grateful I am for all they did to make us so happy for so many years. 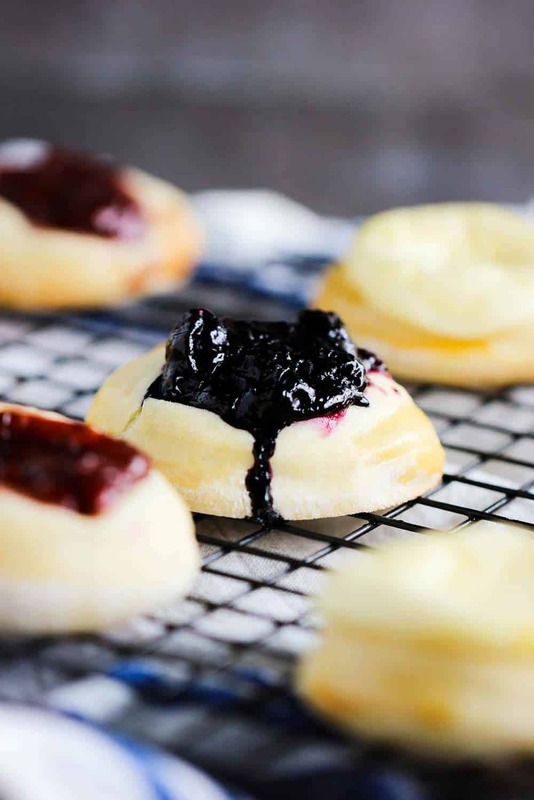 Aren’t you hungry for Homemade Kolaches? I am. These are as fun to make as they are to eat. And your family and loved ones will treasure them as much as you do. If you like delicious pastries, you got to make these Homemade Kolaches. Nothing conjures memories of special times with family more than when I'm making a batch my Grandma's Homemade Kolaches. They take a little TLC, but they are so worth it. Make sure to let the dough double in size, once in a slightly oiled bowl, and then again once the pastries have been formed. Pastry perfection. In the bowl of a stand mixer, fitted with the dough hook attachment, add the flours. Whisk in the sugar and the salt, and then whisk in the yeast. Turn the mixer on low and add the water, milk and egg. Increase speed to medium and add softened butter. Beat until smooth and elastic, about 5 minutes. (You can do this by hand, too, but if take about 20 minutes of kneading). Place dough in an oiled bowl and cover with plastic wrap and let rise until double in size, usually an hour to 2 hours, but could take longer. (You can also place in the refrigerator for overnight). On a floured work surface, roll out the dough to 1/2-inch thickness. Using a 3-inch cookie cutter, or an inverted metal can, or an inverted glass, cut rounds from the dough. Re-roll the scraps, and cut more rounds. Place each round on a parchment paper-lined baking sheet, about 1 inch apart from each other, cover with a damp towel and let rise at room temperature until nearly doubled in size, about 45 minutes to an hour. Using your thumb, press 1 large indention into the center of each round, leaving a 1/2-inch wide rim. Spoon about 1 tablespoon topping into the indentions. Bake until golden brown, about 15 to 25 minutes (depending on the size of the kolaches). 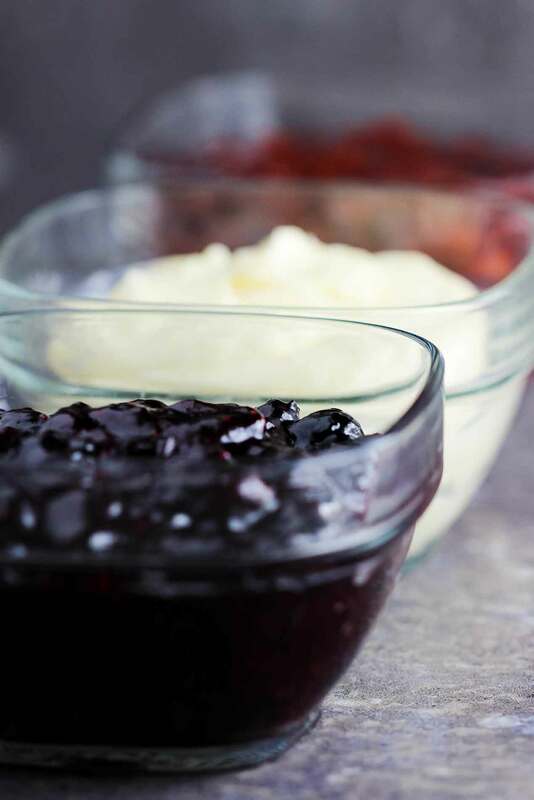 In a medium bowl, combine the cream cheese and sugar and mix until smooth. (A hand mixer works well). Beat in the yolks and vanilla. In a medium saucepan, combine the sugar, cornstarch, salt and cinnamon. Add the blueberries and lemon juice and cook over medium heat, stirring, until sugar dissolves. Reduce heat to low and simmer until thickened, about 8 minutes. Let cool. In a medium saucepan, combine the sugar and cornstarch. Stir in the reserved cherry juices and cook, stirring often, over medium heat, until the mixture thickens, about 8 minutes. Remove from the heat and stir in the cherries. Let cool. These look absolutely delicious. Any type of filled pastries are the type of pastries I want in my belly! The blueberry topping looks perfect on top. I can’t wait to eat this! Thank you, Amanda! I make these a couple times a year, and every time, Wesley (The Loon), asks me why I don’t make them every other day! 🙂 Thanks again!! These traditional pastries are so wonderful! I love them with apricot filling in the center but now I want to try the poppyseed ones that you mentioned as I have never had those! Thanks for sharing your grandma’s recipe! I grew up in Nebraska and we used to go to Clarkson Nebraska to attend Kolache days… they were authentic and delicious. Ive tried many recipes over the years to recreate them, but this is the first one that actually reminded me of how wonderful they were! Thanks so much for sharing! What a beautiful pastry! I love the story behind it — recipes with stories are the very best. Keeping up with tradition is so important. I’ve never tried making kolaches but you’ve inspired me to give it a go. The fillings I imagine are endless. Lovely recipe! You don’t see a lot of desserts that call for leavened dough. I’m guessing it’s something people don’t want to commit to time-wise. While that’s understandable, these look absolutely fantastic, and clearly worth the effort. Baking Grandma’s recipes always invokes such warm memories for me. They’re such a treasure. I’m a little embarrassed to say that I have never had the pleasure of meeting kolaches, but boy! I sure want to now. They sound like a wonderful vehicle for my homemade jam. Oh my gosh.. you’ve made me want to bake! (And that’s quite a task there mister!) But mostly I want to go back in time to your grandma’s kitchen and eat her kolaches! 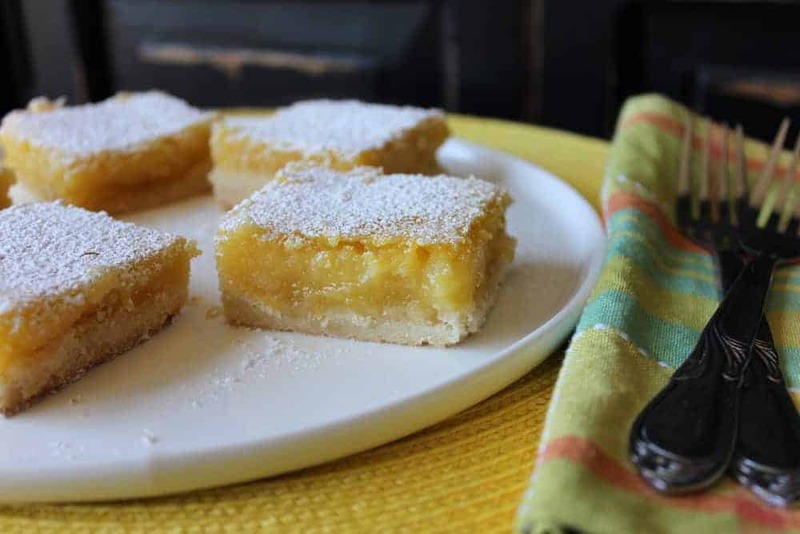 I might just try to make these- I can almost smell them through my computer screen!! I’ve never heard of kolaches before! I love seeing recipes like this that are passed down from generations and then shared with the rest of the world. These pastries are beautiful! Thanks for sharing. The pastry looks so flaky, pure perfection! I would love some with a cup of coffee in the morning. I can also see serving these at a nice tea party. Grandma’s recipes are the best! A true treasure for sure. Oh my gosh I haven’t heard of these in SO long!! My grandmother was Czech, too! And my dad was a certain percentage, that I don’t remember now, but I have (unfortunately) vague memories of these! These look sooo amazing! Hi Tracy! There are definite perks to having a grandmother who is Czech…and homemade kolaches is definitely one of those yummy perks! Thank you!! Grandma’s….or in my case and your too baba’s….we awesome ladies. They could work magic in the kitchen, and everything was ALWAYS so delicious. I know for sure if baba was here, she could run circles around me….and I wish we could have their delicious foods forever. What a great post. I’m so glad tomorrow is Sunday because that means I have a little extra time to make these! 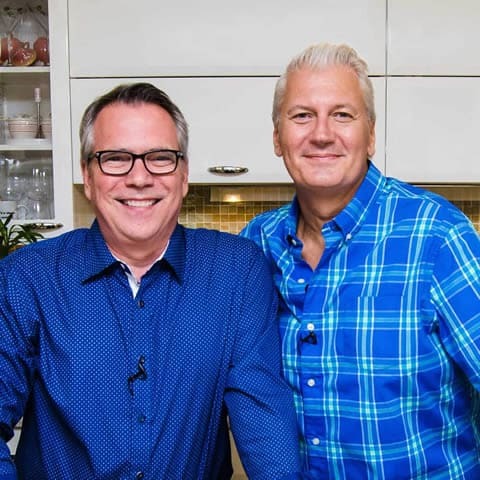 Yay – they look fabulous, I’m always searching for a delicious homemade unique recipe. This dish is always a good idea, no matter what season it is. I am also Czech and my grandmothers kolaches were amazing. I am 50% Czech so I’m a half-hunky . I can’t wsit to try this recipe. Thank you for all the fantastic recipes. 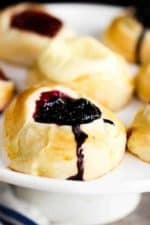 I have a few different recipes for kolaches. I’m going to try this one for an upcoming family gathering. My mom and my grandma made them often, and they made poppyseed, pineapple, cherry, blueberry, strawberry, and raspberry fillings. I remember how hard it was to choose when they were placed on the table. Do these freeze well of wrapped individually? My Great-Grandma and my Mom used to make these (Great-Grandma’s family was from Prussia). The poppy seed were the favorite in the family. I loved lemon. My mom would drizzle icing on hers. I am saving this recipe and I will be making these. I miss those two ladies. Aren’t they just the best! I love poppy speed, too. And of course, lemon!! Yum!! Let us know if you make them and how they turn out! Look good! I too come from, on my moms side, a line of czechs. 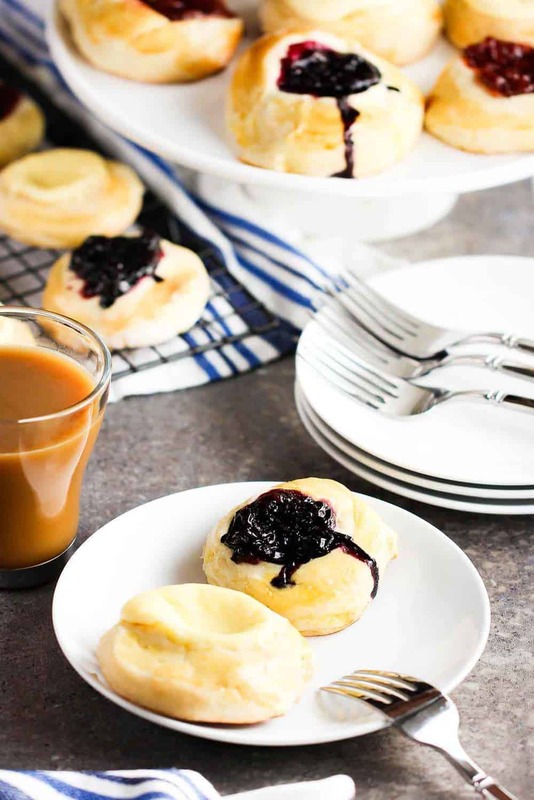 So I am well acquainted with kolaches… though never hurts to take a look at another recipe. One thing I noticed missing was the little crumbly topping that we always top ours with. I forget what it’s called, but it it’s very much like streusel, and just adds that little something extra (not that they need any extra, but still… it’s good). Look so good! I never knew what Czech pastries were! OMG! Apricot were my favorite. You just reminded me that my grandma used to make apricot, too!! My favorite was always the cherry, but the apricot was so delicious, too!! Woo how for Czech Grandma’s!! Do we melt the butter? No, it should be at room temp. Thanks for that point. I’ll update the recipe. I hate when recipes leave that piece of info out…and then here I went and did it myself! i love jelly-filled pastries. they look amazing! I can’t wait to try these – my history is Czech so I am always looking for good recipes from the ‘old’ country. As a kiwi living in Japan I’ve vaguely heard about these but never seen or eaten one which means I need to make them this instant. However it’s 7pm so I should probably make something containing vegetables for dinner? Well, at least I have a plan for Saturday, now. Question; just the 2 of us, it would be fun but probably not a good idea to polish them off before Monday, so how well do they keep? Then I could make alliances at work through pastry….